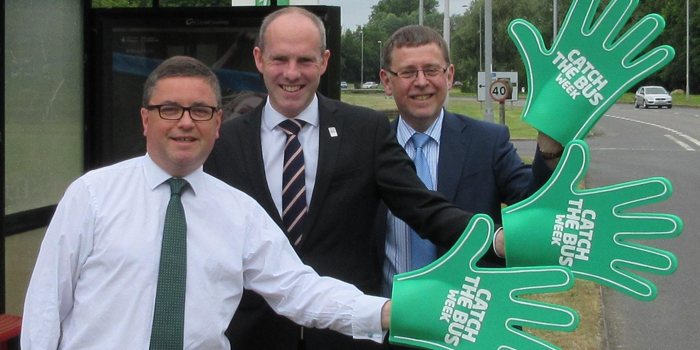 At Thamesdown Transport, we embraced Catch the Bus Week as a wonderful opportunity to promote the benefits of taking the bus, and to encourage the local community to explore Swindon in a green and convenient way. Having recently extended a number of our routes and improved the frequency of services, particularly in the evening, this was the perfect time to promote the bus and encourage the public to consider an alternative way of travel. Our aim was to inspire people to make the most of Catch the Bus Week as an opportunity to see how easy it is to go by bus and the potential savings compared to driving and parking. Our bus network across Swindon links the leisure and retail highlights in the town throughout the day and evening, including Regent Circus, the town centre, the Designer Outlet and the Orbital Shopping Park. For us, Catch the Bus Week was the perfect platform to celebrate the value of the bus in binding our community and keeping everyone in society connected. Our campaign stemmed mainly from social media, as we ran a series of daily prizes to our Twitter followers throughout the week. Prizes included free four weekly TravelPasses, as well as tickets to Cineworld in Regent Circus. Followers were encouraged to tweet reasons to use the bus, or to tweet something great about Swindon, demonstrating the role that the bus plays in building the community. We are thoroughly committed to promoting what our town has to offer and it is immensely important to us to remind people just how great Swindon is. We were very glad to have the support of two parliamentarians for our campaign, with Robert Buckland MP and Justin Tomlinson MP launching the competition. The members for South Swindon and North Swindon respectively were ‘on hand’ to support our campaign and we were delighted to have their involvement with the launch. It was a great pleasure to be involved with Catch the Bus Week this year, and to have the opportunity to demonstrate the importance of bus services to the local community here in Swindon. Combined with all the activity across the UK, it was fantastic to see the impact that the week had on travel choices.